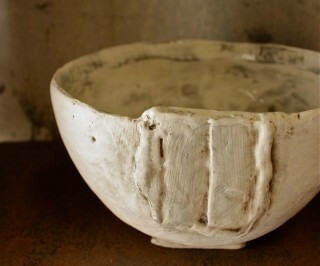 Akamine’s clay pieces are studies in expressions of dents. One of Okinawa’s best known porcelain artists is in the final days of a Boko-Ten exhibition in the Tsuboya pottery district of Naha City. Manabu Akamine is showing his specialties, and also offering some of them for sale through Sunday at the Tou Yokariyo in the Tsuboya pottery district. Admission is free for the exhibition, which runs daily through Sunday 11 a.m. ~ 7 p.m.
All pieces on exhibit are also for sale. Although he’s an artist who normally creates his works in porcelain, a rarity in Okinawa, for this exhibition he’s also put his efforts into clay. “Boko” of “Boko-Ten” means “a dent” in Japanese, and Ten means exhibition in Japanese. 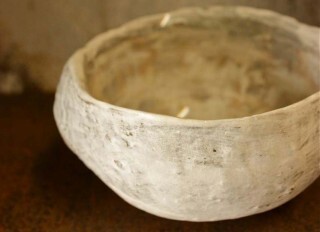 As noted, the show is at Tou Yokariyo in the heart of Tsubyoya, one of the meccas of pottery in Okinawa. The exhibition is new from the standpoint of combining various kinds of chinaware. In the past, Akamine has spent time working as a lecturer on ceramic art on military bases in Okinawa.